Trail Acc Trailer Manufacturers & Sales build this special luggage trailer for sale with an extra long load length of 2,4m to accommodate objects that do not fit into a standard trailer. Build quality is guaranteed as it complies with both SABS specifications and the standards of the National Road Traffic Act. The trailer is suitable to transport goods like small household goods, boxes, luggage, beverages and groceries items etc. Trailer can be used with or without lid. No onboard brakes. Tow vehicle specifications: Cars, bakkies or 4x4’s with a minimum engine size of 1.5ℓ or larger. 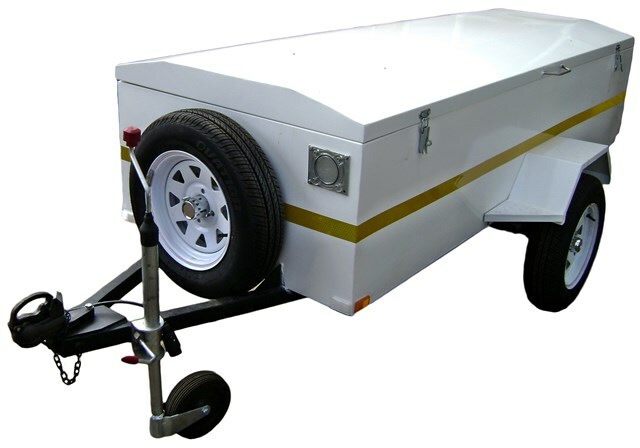 To buy your own luggage trailer of 2,4 length contact us today for best prices. Our well trained sales staff will assist you.